Title II of the Americans with Disabilities Act (ADA) provides comprehensive civil rights protections for “qualified individuals with disabilities.” The Title II regulation covers “public entities,” which include any State or local government and any of its departments, agencies, or other instrumentalities. 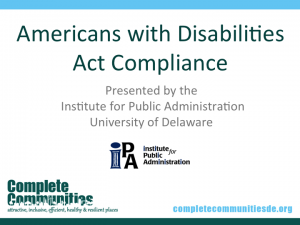 This section of the Toolbox provides an overview of ADA Title II requirements and the need for state and local governments to ensure that newly constructed buildings and facilities are free of barriers, and that individuals with disabilities are not excluded from services, programs, and activities because buildings are inaccessible. The Americans with Disabilities Act: What is it? Back to Complete Streets | Next to What is ADA?